Sekonda has been the bestselling watch brand in the UK for over 20 years. The range consists of high-quality, attractive watches which are outstanding value for money. Since 1998 there has been rapid change with the introduction to the worldwide market of numerous fashion brands. Sekonda still remained the number one selling brand but action had to be taken. In 2004 SEKSY was born. With many years of experience in watches, the Sekonda team turned their expertise to the fashion arena and developed a product aimed at the 25-35 age groups. Originally the range consisted of just 11 models but now has a vast range. SEKSY watches are designed to be different to other fashion brands but still carry the Sekonda ethos of giving the customer an excellent product at competitive prices. Many of the items in the SEKSY range are decorated with Swarovski crystals. The leaded crystal glass of the crystals shimmers and refract as light shines through creating a fascinating twinkling effect reminiscent of a high-clarity diamond. 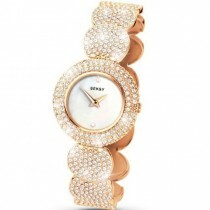 These SEKSY timepieces are the ideal watch for all occasions.